The time has come… for The Journey to the West! James has been waiting years for us to cover this classic tale of heroes, demons, and the search for enlightenment. He discusses Daoism, Buddhism and Confucianism and how the story brilliantly manages to espouse all three. 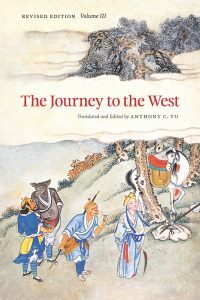 Claire talks about the evolution of the story by walking through the original historic journey taken by the monk Xuanzang in 596 and examines how it became the phenomenon it is today. Our hosts conclude with their thoughts on the Anthony C. Yu translation, why they chose to cover this book, and how well they believe it will pair up with our next topic, Dragon Ball Z.